Retro Vision by Amazing! Co. Hazards: Visual Hazard, Sensory Hazard. Containment Protocols: RPC-125 is to be contained at Site-007 in a standard security containment locker. Basic alpha containment protocols are to be followed with RPC-125. Access to RPC-125 is freely available to those with Level-2 clearance or higher. Personnel accessing RPC-125 should record their name, date, reason for access, and duration of access in log RPC-125-01. Description: RPC-125 is a modified Telstar Predicta Meteor television created or modified by Amazing! Co. as indicated by the latter's logo beneath the television screen. 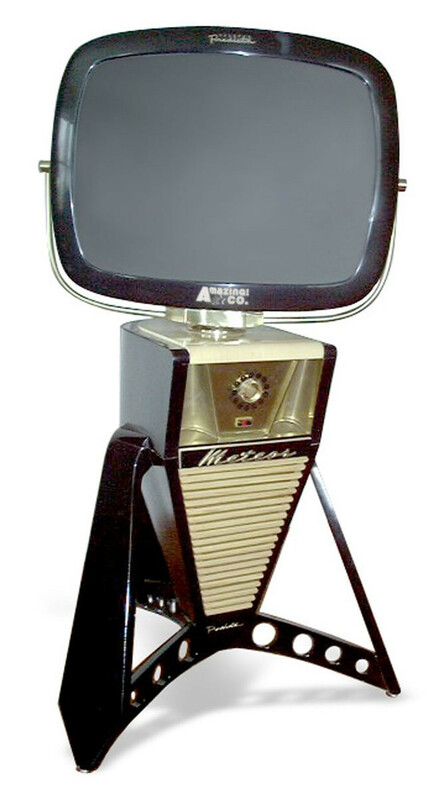 It is indicative of televisions of the 1950s sitting on three legs with a swivel screen on top. It is black with brass accents and logos. A single dial on the front lists numbers from one to thirteen. Beneath the dial is a single red switch that will turn RPC-125 on or off. The panel around this dial appears to change color depending on the angle it is viewed from. RPC-125 weighs ███kg which is more than five times the normal weight for the non-anomalous model of a similar television. It is able to be turned on at any time despite lacking any power source or a plug-in cord. When turned on, RPC-125's anomalous effects are made apparent. Any viewer of RPC-125 standing at any angle will see through the screen as though it were a window.2 The area viewed through RPC-125 appears as though it did exactly one hour before. 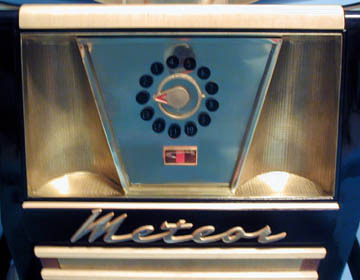 The dial on the front of RPC-125 may be adjusted up to thirteen and the screen will show that many hours before instead. The screen may also be rotated up to one quarter turn in either direction without any disruption of effects. Any rotation of display will adjust what subjects view accordingly. Further anomalous effects manifest in subjects during extended viewing. Any subject viewing RPC-125 will begin to experience immediate change of visual stimuli. Over the course of the first ten minutes of viewing RPC-125, subject's vision will slowly shift to appear grey-scale like that of 1950s-era television. After between ten and thirty minutes, viewers will start to see scan-lines and visual distortions in line with the previous effect. Subjects who continue to view RPC-125 will experience a slow degradation of visual quality until all vision is obscured by signal static after a total of one to three hours of viewing has passed. Testing shows these effects last a duration of approximately one day per one minute spent viewing RPC-125. ONE MUST LEARN FROM THE PAST! WE HERE AT AMAZING! CO. AGREE! TO LET YOU DO JUST THAT! TURN IT ON AND WATCH THE PAST! Look, I don't care how many times you reapply. This thing weighs a damn ton and it has to be moved around with a pallet jack. Not to mention it messes up people for months afterward and only lets you look back half a day. It has a corner case use at best. Please stop trying to get your precious research project classified as Theta. I promise you Dr. ████, If we ever need to know what happened a few hours before and somehow none of our security cameras can provide anything, you're the first we will go to. Nevertheless, this is remaining Alpha. 1. Reclassification to Theta-White pending. Please see Addendum RPC-125-02. 2. For example, a subject standing 30 degrees to the left of center and a subject standing 30 degrees to the right would have a slightly different angle on what RPC-125 shows them.